Calling all scallywags! Are you ready to set sail with your fellow hearties in a quest for treasures beyond your wildest dreams? If yes, then get ready to step foot onto the baron beaches of Ghost Island, where ancient fortune and precious treasures await to be uncovered. Keep your good eye open for the official treasure keys along the way too, as collecting all five keys could win you up to 300 awesome free games! 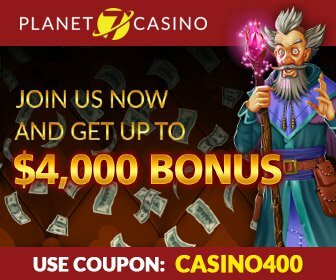 Pirate Isle online slot casino game works with 25 paylines and boasts the most stunning visuals, along with a fully-animated symbol set, vibrant and hilarious onscreen characters, as well as a massive top-end award to really get your timbers shivering! The game mechanics are set out so you can modify your betting amount simply by using the bet arrows. Pirate Isle does not work in the same way as your average slot machine, in the sense that there is no option to modify the number of lines you want to play. 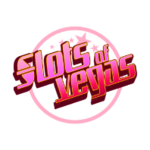 As it is a fixed 25 payline slot, instead you play all 25 lines simultaneously which in some ways actually works in your favor! There is also a unique function in this game known as ‘extra bet’. 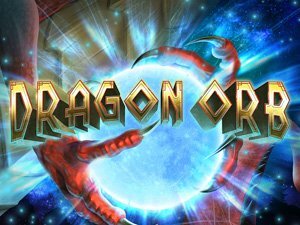 This allows you to wager an additional amount that could lead to a bonus round, and in turn, a very nice looking jackpot! 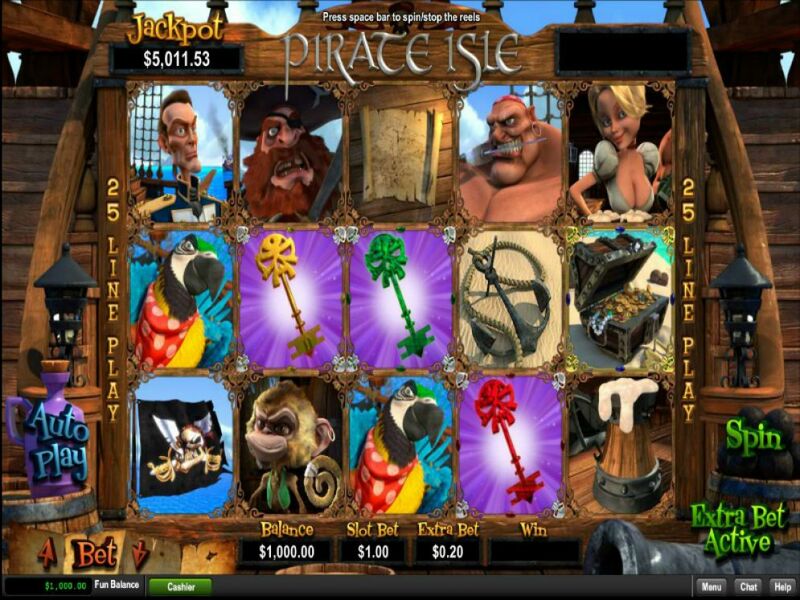 The upmost reward on Pirate Isle is 2,000 x your bet, or a treasure chest full of free games! If you want to increase your chances of hitting the big time – aim for the ‘extra bet’ feature at every possible chance. The ‘extra bet broadside’ feature is triggered when you hit 3 Galleons or more on the reel subject to placing an ‘extra bet’. 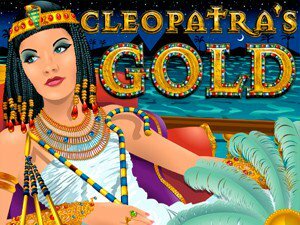 There are many online sites offering this fantastic casino slot game. The best part is you don’t even have to play for cash initially and can get some practice in by using the ‘freeplay’ feature. All you need to do is take a few minutes to register an account, then you can start to get a feel for the game immediately. This symbol packs a lot of powers! Aside from being the scatter symbol, it’s also your trigger for playing a bonus feature. Hit three of them with the Extra Bet feature on, and you’ll be able to play a bonus game. 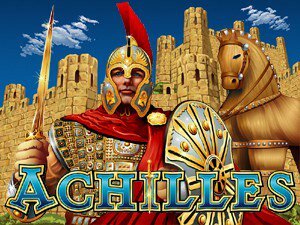 Is also a scatter symbol, the Treasure Chest symbols do not lead to the Extra Bet feature game, but these are added to line wins and act as multipliers to your game bet. Classed as the wild or substitute symbol, the Skeleton Key can replace any other symbol (other than scatters) to help you complete a winning combo. You’ll automatically earn 100 free spins, if a Pirate Ghost shows up during the Treasure Chest feature! If you want the machine to spin automatically, simply turn AutoPlay on. The software will spin for you and pay you out for any wins by itself. Even after you have won, it’ll spin for you again until your balance runs out or you switch it off. Does Pirate Isle have a jackpot? Can Pirate Isle be played for real money? What’s the best way to win big at Pirate Isle? 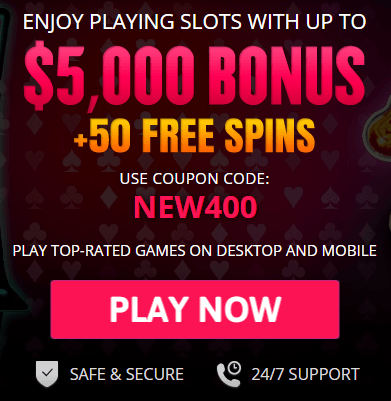 USA Casino has put together a detailed list of all the online casinos offering Pirate Isle. 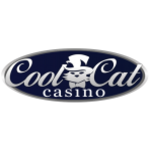 These casinos allow you to play for free, and for real life treasures too! Head over to the link below and get ready to jump into a lagoon of golden riches and pirate booty!